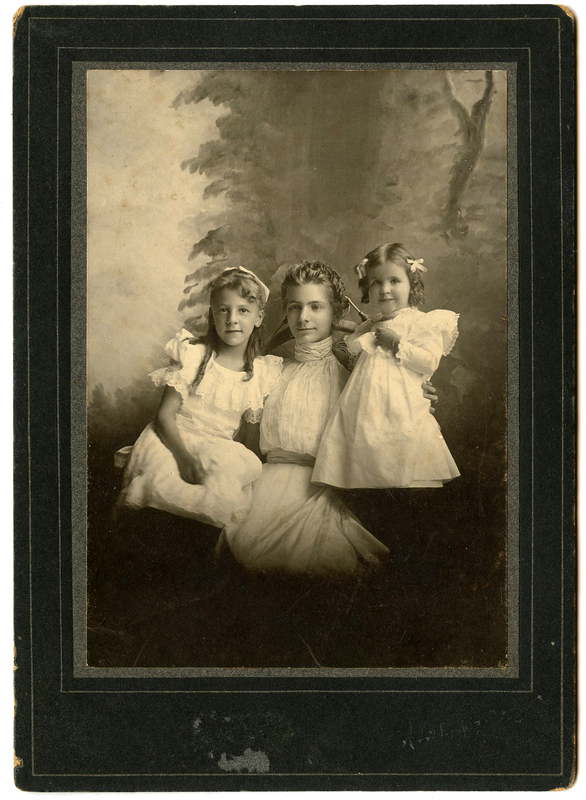 Today I’m sharing these 2 Vintage Photos of Mothers and Children. These are lovely old fashioned nostalgic photographs. Both are antiques and would be wonderful to incorporate into a Vintage Family themed Junk journal, or perhaps to use for a handmade card for your Mom, or someone that has been like a Mother to you. They are black and white images and have not been tinted. These were scanned from my collection. I have been organizing my stacks of old paper things and I have quite a large drawer of Antique photos, it’s a much larger stash than I had realized! This first vintage photo is one that I have always affectionately referred to as the “pretty family”, and as you can see they are quite pretty! I originally offered this one back in 2007 when my blog was new. I have rescanned it at a higher resolution so make sure you download it again, if you have that earlier version. The Mother in this picture has such a beautiful face and it looks as though her hair is done up in French Braids. Both of her daughters are lovely as well, with their blonde ringlets topped with white ribbons and bows. The whole family is dressed in white clothing. And there is a marvelous rustic old Photo Frame surrounding the scene. Next up is this lovely Old Family Photo ! 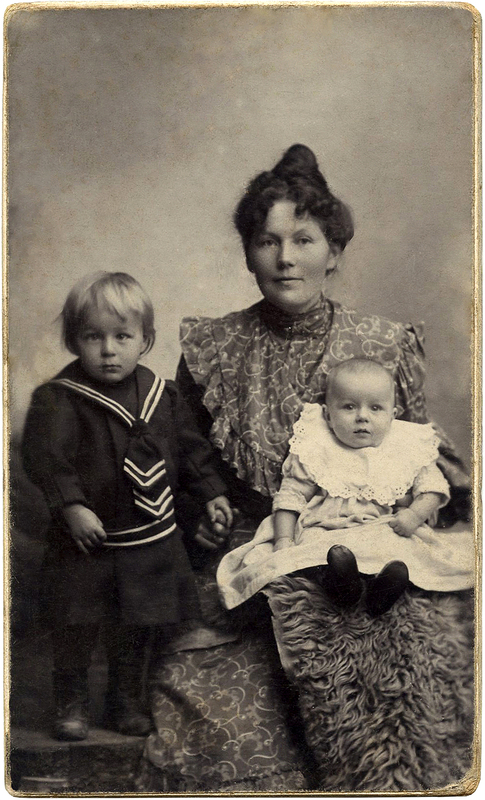 This is an Antique Photo PostCard showing a Mother with two small children… a toddler and a baby. The little boy is dressed in a classic looking Sailor Suit with cute little high top shoes. I can’t tell if he’s a bit cross eyed or if it is just the way that the light is hitting his eyes. Either way he is just so dear! 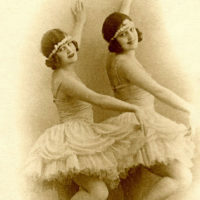 The baby appears to be a girl, although boys were often dressed this way back in the day, so it’s hard to say for sure. She is wearing a long baby dress with a large white collar trimmed in eyelet lace. Her sweet face looks a bit surprised, probably the flash of the camera caught her off guard.. The Mother is wearing a long printed Cotton dress with a ruffled edge on the bodice. Her hair is piled up with a bun on top of her head, and her soft curls framing her face. She has a furry looking lap robe on her lap, to keep the baby cozy. It was perhaps a cold day when this photo was taken. They make a lovely Family, don’t you think? I’m not sure where the Fathers were in these photos, perhaps they were the camera men taking the pictures. This would be wonderful to use in Collage or Mixed Media projects or for a Handmade Mother’s Day Card! You might also like another popular Post with a similar theme from HERE. 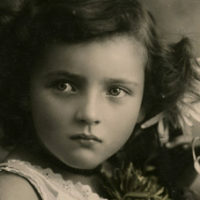 I hope you enjoyed these Vintage Photographs of Mothers and Children. Thank-you Karen! I have been looking for a vintage photo of a family to use(been hunting this week) for a new purse idea I want to kick off for my biz, so excited to have this, awesome! Love this – thanks so much Karen for all you do.